On the heels of 10th Tawang Maitree Diwas, the first ever West Kameng Maitree Diwas was organized by the Indian Army and Rupa administration at Rupa Stadium in West Kameng district amidst great excitement and hope, taking all present with surprise. In four hours of jam-packed performance, the Army as well as civil artistes put a splendid display of military skills and cultural extravaganza. 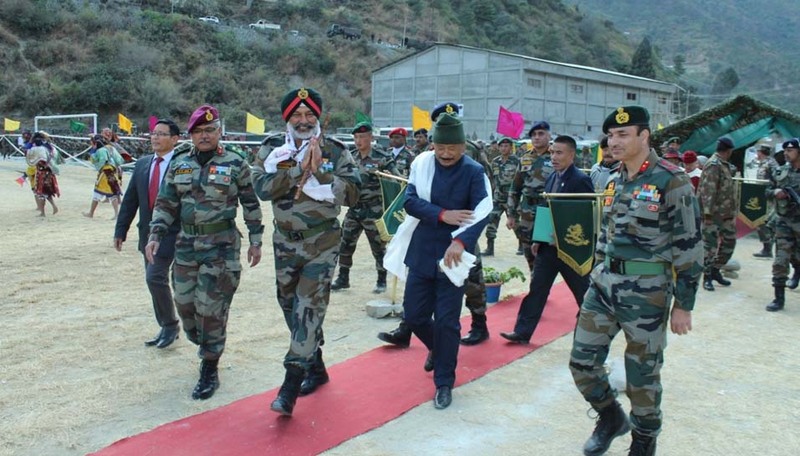 Soon after a joint decision was taken by Arunachal Pradesh Chief Minister Pema Khandu and the Gajraj Corps Commander, the necessary preparations were made on war footing giving shape to the long awaited dream of the locals. The proceedings, organized under the guidance of Major General RK Jha, GOC, Ball of Fire Division, were chaired by Dr Mohesh Chai, Arunachal Pradesh Minister for Agriculture and Sports, and Lt Gen GS Sangha, the Corps Commander. Minister Chai moved at a short notice as a special representative of the Chief Minister, who could not make it for the event. The display of military drills and equipment was liked by the locals and school children who were present on the occasion. On the sidelines of the event, a bicycle expedition from Rupa to Bumla under aegis of National Institute of Mountaineering and Adventure Sports was flagged off. Addressing the gathering on the occasion, Minister Chai, who was present at the event as the Chief Guest, appreciated the superior performances by all the military and civil participants. On behalf of the CM, Minister Chai assured of making the West Kameng Maitree Diwas an annual event, marking the strong civil-military relationship in the district. The Corps Commander applauded the efforts of the Indian Army and the Rupa administration for the show put up during the inaugural edition of West Kameng Maitree Diwas. Amongst the other dignitaries present were Chief of Staff, Tezpur Corps, IG Police, Sh Sunil Garg and other senior military and civil administration officials. The event dawns a new era in the history of Rupa and the civil-military relations in the state as part of the vision of Lt Gen MM Naravane, the Eastern Army Commander.